Think outside the box with a multiple monitor setup. 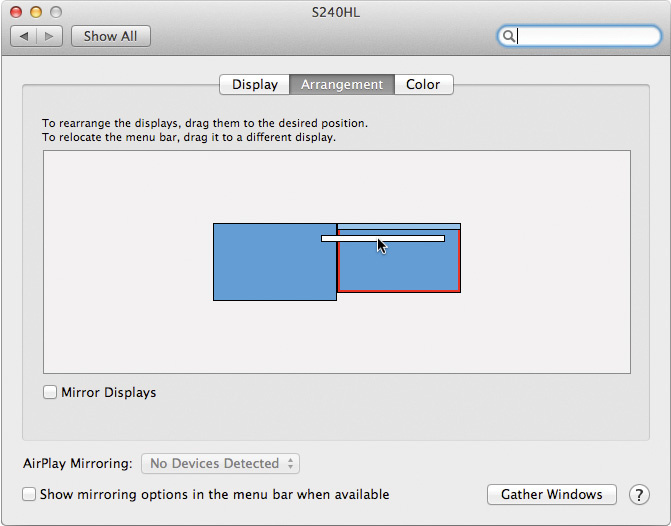 Do the basic configuration of your multiple-monitor setup in System Preferences. Modern music software can be a lot nicer to use on multiple monitor setups; it can aid clarity, it lets you keep mixers and plug-in windows open, and it looks really cool to boot! Most recent iMacs and MacBooks can drive at least one additional monitor without breaking a sweat, and decent high-resolution displays are amazingly affordable, so there's never been a better time to spread out a bit. Apple have been through a few video output standards over the years, and if you're not sure which your Mac is equipped with, you can find out on sites like www.everymac.com or via the excellent freeware Mac OS and iOS app Mactracker (downloadable from the respective App Stores). You'll always get best results if you can make use of a digital input to the second monitor, such as DVI or HDMI or, indeed, Mini DisplayPort or Thunderbolt in the case of Apple's own monitors. You'll often be able to source the exact cable you need online or from an Apple Store, or cut-price on eBay. If not, readily available adaptors at the Mac end should work just as well. 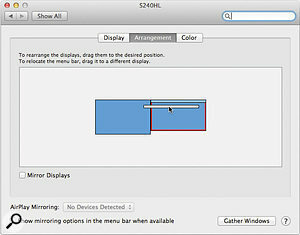 With a second monitor connected and powered up, basic configuration takes place in the Displays pane of System Preferences. The Arrangement tab shows how your main and secondary monitor relate to each other. Click on one of the blue screens and a red border appears around the edge of the associated monitor to help identify it. 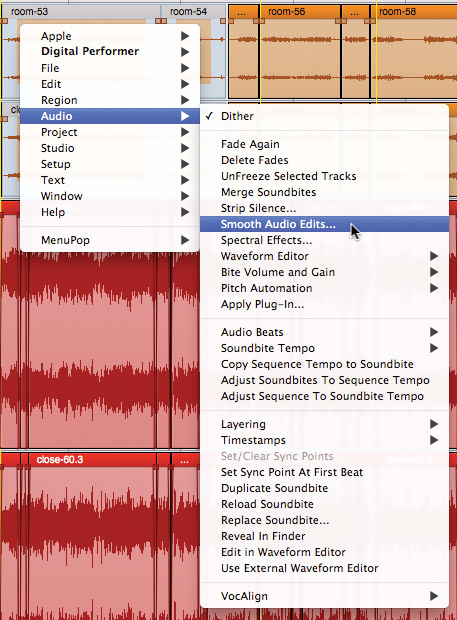 Then, if necessary, you can drag it to match the actual physical positions of your monitors. Where the edges touch represents where the mouse pointer can cross from one monitor to another. You can drag the little white strip too, to decide which monitor gets the menu bar and dock. The Mirror Displays option just causes both your monitors to display the same thing, which is not normally what you want in the studio. On the whole, OS X's handling of multiple monitors is solid, if surprisingly rudimentary. For example, in OS X 10.7 and 10.8, applications running in full-screen mode occupy one monitor while leaving others with an infuriating blank, redundant 'cloth' background. Expect improvements in this specific area in OS 10.9, but in the meantime a number of third-party multi-monitor gizmos are well worth checking out. 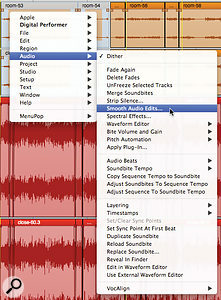 Here's MenuPop making Digital Performer's main menus into an alternative contextual menu. A few Mac App Store apps are specifically created for users with big high-resolution monitors, where it's all to easy to lose track of where your mouse pointer is, or where continually mousing to menus at the top of the screen is (literally) a pain. CatchMouse (free) instantly resets your mouse pointer position to the centre of any display when you tap a keyboard shortcut. Wormhole (69p99¢) lets you position two vaguely terrifying looking 'black holes' anywhere on your monitors, and when you move your mouse pointer into one, it'll appear out of the other. Kind of like a PacMan warp tunnel for your screen. Meanwhile, MenuPop (£2.99$4.99) causes your menu-bar menus (including the Apple menu) to appear in a pop-up contextual menu anywhere, on any display, in response to a keystroke or non-left/right mouse-click. It's a great idea, and not just for music apps, either. Finally, if you have an iPad, why not use it as an external monitor? DisplayPad allows exactly that, and takes the form of a free Mac app (for OS 10.6 or later) that you download from www.displaypadapp.com and a £1.99$2.99 iPad app from the iTunes App Store. Your Mac and iPad have to be connected to the same wireless network, but then (with almost no configuration required) the iPad appears as a proper, bona fide monitor that you set up in System Preferences on the Mac like any other. Retina iPads end up with a whopping 2048 x 1536-pixel resolution that makes graphical elements rather small, but as the screen is so sharp and you're likely to be using it at quite close quarters, that's actually advantageous. Just one gotcha: apparently the system won't work if your Mac has an NVIDIA GeForce 9400M graphics card and you're using OS 10.7. Otherwise, you should be fine, and the responsiveness of the system is impressive.